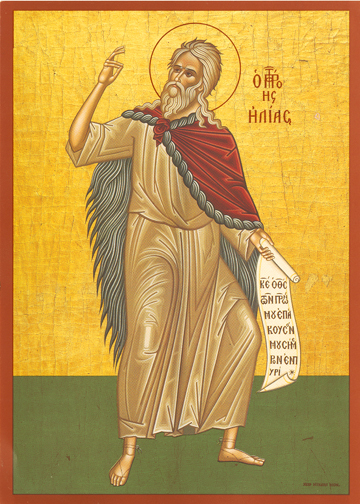 The Prophet Elias (Elijah) was the most renown among the Prophets, and one of the two humans, along with Enoch, who were born in this world but have not yet died. Holy Tradition teaches that Elias will come back to earth with Enoch at the time of Antichrist, and they will die then as martyrs. The holy Prophet lived in the ninth century before Christ and was fiery in his ministry and then, at the end of his work, was taken in a fiery chariot up into Heaven where he awaits his return and witness for Christ. The holy Prophet rebuked the King Ahab and his pagan wife Jezebel had who influenced the king to worship Ba’al. Ahab had set aside groves to that strange god, and he listened to the false prophets who prophesied in Ba’al’s name. Because of Elias’ prayers it did not rain in Israel for three years until Elias returned into the Kingdom from voluntary exile and proved to the people that the Lord God was the only true God, slaying the 450 false prophets with a sword himself after God sent fire from Heaven to prove Elias words. God then sent rain on Israel. The rest of the Prophet Elias’ story can be found in I Kings, chapters 18-22.